There’s nothing like a Great British Wedding – Champagne, Strawberries, Roses, Laughter…. and looking around the woodlands and meadows I can almost taste the summer coming – the local farmers swear there is a single day when the earth wakes and all the grass starts growing, from there it is only a short hop until the air is buzzing and our sons friends nag to come and play cricket in the meadow. It’s not me being romantic or misty eyed, it’s how it happens. 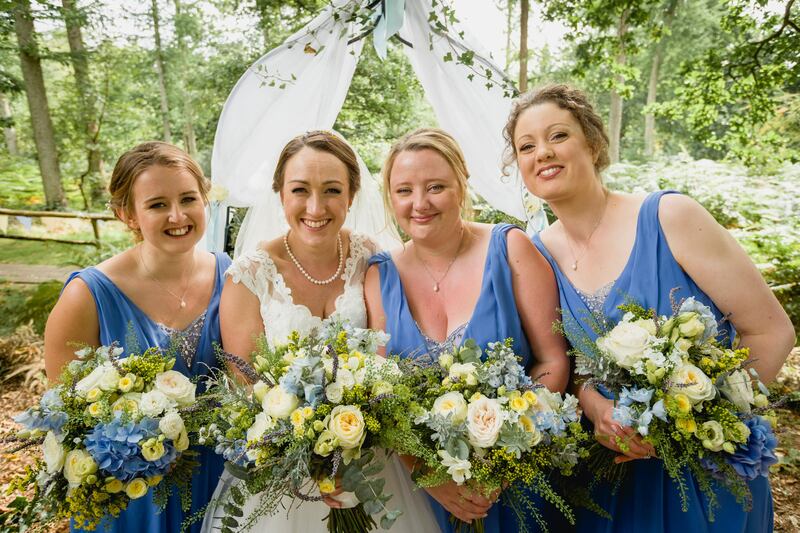 This got me thinking how we started weddings – it all started when two of Tim’s very close friends asked to get married at Middle Coombe Farm – they were the best ever and everyone said you must do weddings! So we rebuilt our lovely Cider Barn for the legal ceremonies and offered our traditional “old man of the woods” ceremony under the old oak tree – exactly where Tim’s friends chose to “Tie the Knot”. Those weddings and every one ever since have been totally magical with not a dry eye in the audience. 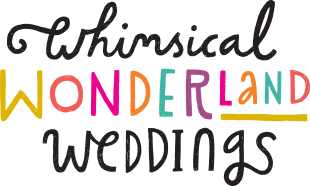 Reflecting on our weddings we are lucky to have so many facets for couples to use and explore over their wedding weekend – with accommodation, pool, hot tub, woodland, meadows, cider barn and more making it a successful time for families to come together. From the day of Tim’s first friend’s wedding, we knew that it was possible to create a Great British wedding at Middle Coombe Farm. 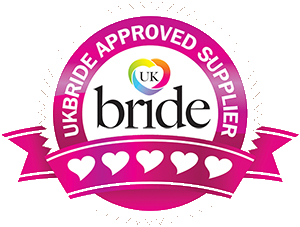 Now, we have carefully built our scrapbook of wedding ideas is full of amazing British and local suppliers that simply know how to make a wedding! Here are just a few of our favourites that make a truly British wedding! The Great British Florist, Heather Gorrenge, has it covered. And YES you can have colourful bouquet harvested in the UK – all year round. Whether it is Grape Hyathinths and fressias (one of my favourites) in the spring peonies, roses and sunflowers in the summer or dahlias and sedum in the autumn there are vibrant colours to be had. For winter bouquets she suggests eryngium mixed with Senecio cineraria which is naturally dusted silver. And don’t forget every Middle Coombe Bride is welcome to take foliage for her bouquet from our garden, meadow or woods for that special touch. With so many British designers to choose from Britain certainly has talent. It is rumoured that they may be the best in the world – so why not look closer at designers such as Jenny Packham, Alice Temperley or Amanda Wakeley. Each has their own unique signature, so take the time and fun to try lots on! The wedding breakfast is the obvious place to start – with more than half our food coming from abroad the food can travel miles, yet with an organic beef heard and traditional orchard we know that looking closer to home can pay off. Just a stones’ throw from us is the wonderful Yearlstone Vineyard, whose wine tastings will not leave you disappointed. Our famous scrapbook also contains ice-cream sellers, hog roasts, private caterers and more – and we have had the pleasure of tasting the lot! Other local friends include people like Bamptons Beautiful Bunting and Icicle Tricycle a classic 1920’s ice-cream tricycle that is a real crowd pleaser! 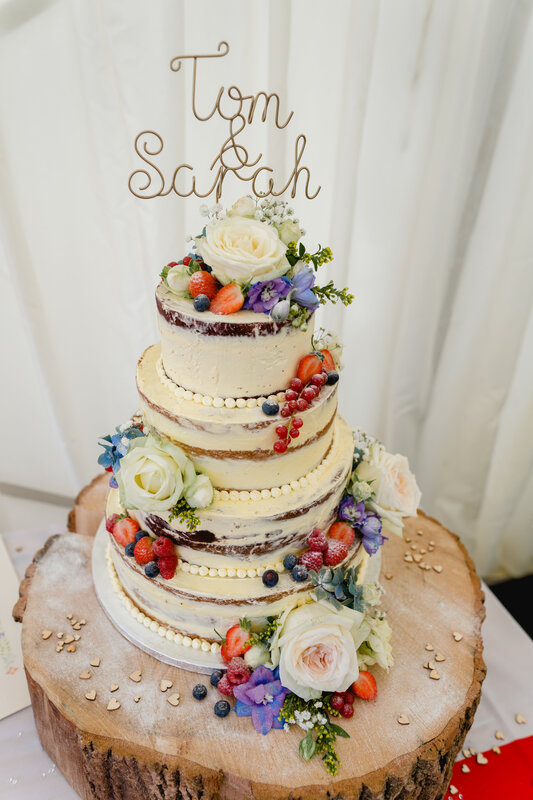 With rolling Devon hills, cool woodlands, hazy meadows and the chocolate box farmhouse Middle Coombe Farm is quintessentially English… whether you celebrate your union with cucumber sandwiches or pie and chips we promise a weekend to remember. For those of you wondering, I have to confess Tim and I eloped to the Isle of Scilly. Now we love it when we host elopement wedding under the trees or in the farmhouse – and share the moment with the happy couple. 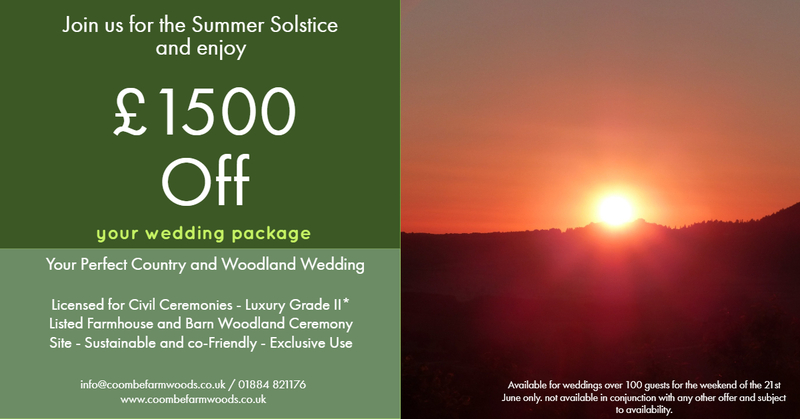 The Summer Solstice is a perfect day for a wedding – traditionally linked to Love, fertility and more recently Gay Pride the long days make a wedding this weekend particularly poignant. Our traditional stone circle or Ancient Oak can form a meaningful focus to your celebrations, while the cider barn and marquee can be used for the wedding breakfast – you could even have a picnic in the meadow. If you would like to celebrate with us in 2019, we are offering £1500 off our standard weekend package – but as there can only be one wedding we are guessing it won’t be free for long! 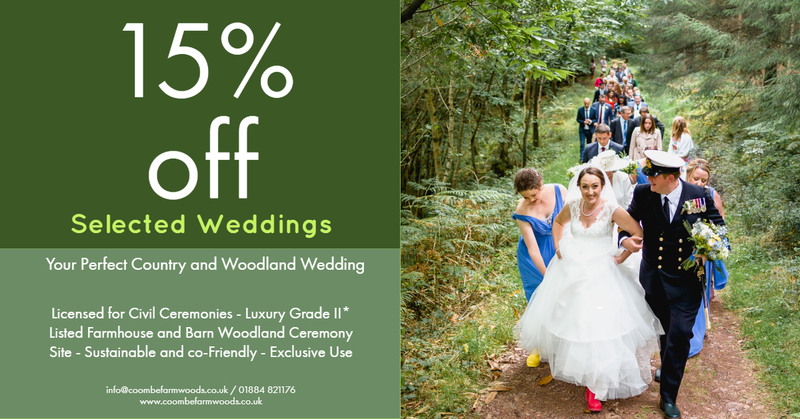 We are delighted to be able to offer 15% off the following 3-day, weekend weddings for 2019. Email, phone or message us for more information. As the year closes, I’m drawn to the trends and themes for next year. It’s cold this morning and after a crisp morning walk with Pippa our Jack Russel, I’m taking a little time to plan the year ahead. With the fire stoked and the coffee close at hand I can’t quite believe December is here once more. Everywhere I look trends are being published for 2019. These themes for everything from fashion and weddings to lifestyle and holidays are increasingly important. 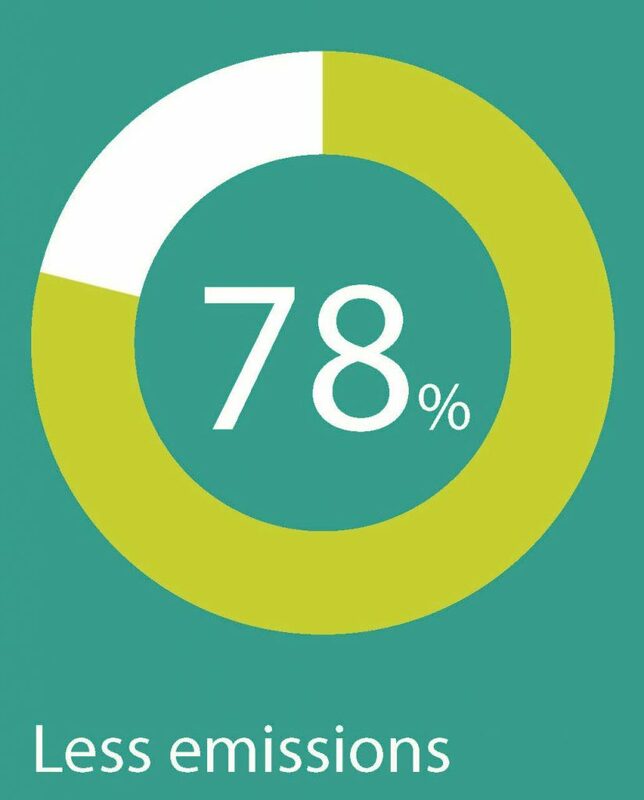 Looking at the trends for next year we are naturally delighted that the environment remains a hot topic. Awareness around the amount of plastic polluting our oceans remains high – I’m still shocked that approximately 8 million pieces of plastic make their way into the ocean every day. Weddings can have a significant impact on the environment which is why I was delighted to see Meghan and Harry reflecting on their environmental footprint and making small changes. Simply using flowers that were in season, going plastic free, using recycled paper and sourcing locally made their wedding more eco-sensitive. By donating their flowers to charity afterwards the happiness was spread even wider. We know that small changes make a huge difference. Ever since we opened the doors to guests and wedding couples over 10 years ago, Tim and I have put the environment at the heart of everything we do constantly lowering our environmental footprint. We believe we are stewards of this wonderful valley – its woodland, pasture and glades as well as our beautiful grade II* listed farmhouse that nestles at its heart. We are also believers that changes do not mean compromising the luxury we enjoy. 95% of our heat is from renewable resources – primarily logs cut from our woods, the remainder is from environmentally friendly sources. Our swimming pool and hot tub are completely carbon neutral heated entirely by solar power and our farm is completely organic. All our complementary tea and coffee is fair trade and we support our local food producers, restaurants and transport. These little unnoticed changes have led to our weddings producing 78% fewer emissions per guest than the industry standard. 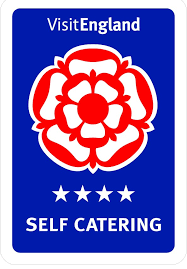 Something we are extremely proud of every day. Looking ahead we are looking forward to welcoming back a number of old friends as well as having the opportunity to meet through the weddings and holidays booked. 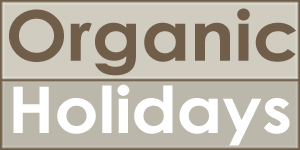 The Devon School of Yoga are joining us for the 5th year running and the Two Moors Festival will again return in March for their young musicians competition – not to mention numerous others joining us to celebrate birthdays, hen nights anniversaries or to simply spend precious time together. So, if you are thinking about your holiday, wedding or organising an event why not think about how the impact on the environment can be reduced without sacrificing style or impact. 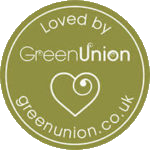 We have loads of ideas or for wedding ideas from compostable vegetable cutlery (see www.vegware.com) or why not pop over to our friends at Green Union – www.greenunion.co.uk to see what is possible. 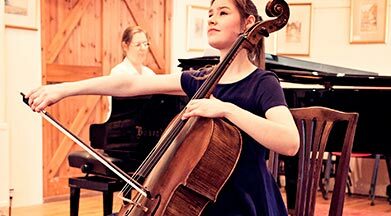 We are delighted to be hosting the Two Moors Festival, young musiucians competition for 2018. Renowned as one of the leading classical music festivals in the UK the event draws visitors from around the world and we are so looking forward to the Cider Barn, Farmhouse and surrounding grounds being filled with beautiful music.